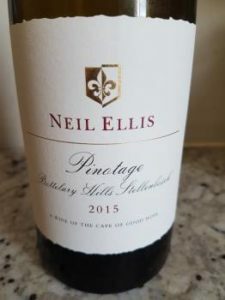 As we all know, Pinotage is a hit-and-miss affair. Get it wrong and the resulting wines can appear particularly disjointed. Get it right, however, and you end up with the excitement of the exotic not provided by the likes of Cab or Merlot. The team at Neil Ellis Wines have absolutely nailed it when it comes to the Bottelary Hills 2015. Grapes from 20-year-old bush vines, fermentation was begun in tank and finished in barrel, maturation lasting 16 months in French oak barrels, 50% new. The nose is particularly enticing with notes of cherries, plums, fynbos, earth and spice. The palate is relatively medium bodied and well structured – fruit which is pure and sweet in the best sense, lovely fresh acidity and fine tannins. Possessing real depth of flavour and a finish that’s long and savoury, it’s one of the best judged expressions of the variety currently out there. Approximate retail price: R300 a bottle.